Designed to appear subtle and inconspicuous, the 5.11 Tactical COVRT 18 is a full-sized covert backpack that provides superior tactical utility and efficiency in a wide range of environments. Also perfect for off duty CCW use, the COVRT 18 features a Backup Belt System compatible hidden pistol pocket and a concealed R.A.C. (Roll-down Assault Compartment) that can house a full sized firearm. 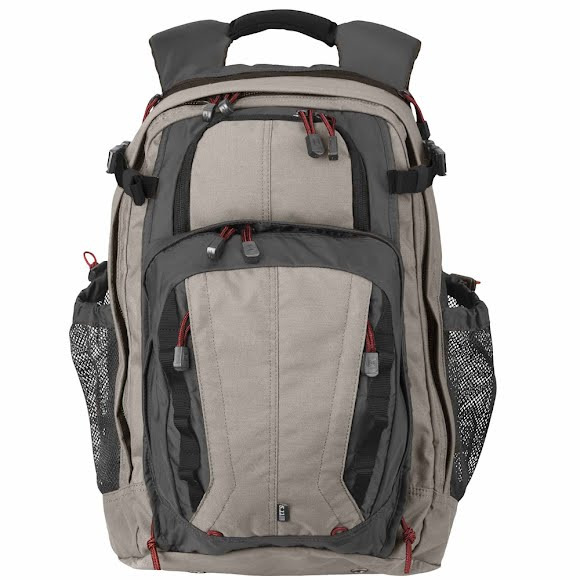 Designed to appear subtle and inconspicuous, the 5.11 Tactical COVRT 18 is a full-sized covert backpack that provides superior tactical utility and efficiency in a wide range of environments. Also perfect for off duty CCW use, the COVRT 18 features a Backup Belt System compatible hidden pistol pocket and a concealed R.A.C. (Roll-down Assault Compartment) that can house a full sized firearm. QuickTact accessory straps at the shoulder integrate with other 5.11 tactical gear, a padded sunglass pocket keeps your eyewear protected, and a flip down ID panel allows you to go from covert to overt instantly. The main compartment provides a padded laptop sleeve and roomy main and secondary storage areas, while adjustable yoke shoulders, compression straps, and a reinforced grab handle ensure easy carry. Measurements 19"H x 12.25"L x 6.5"